I always glance at the headlines of Le Matin and Tribune de Genève while walking down rue de Rhône each day to the gym. I am used to translating the day’s feature from French to English in my head for practice. However, today’s news caught me by surprise with a topic familiar to all of our US readers, mainly because it was a day late. But it does make sense that as the election was confirmed in the USA, it was 5 or 6am here in Geneva, well past the print deadlines for that day. So, today was the big day for European media to cover the US election. 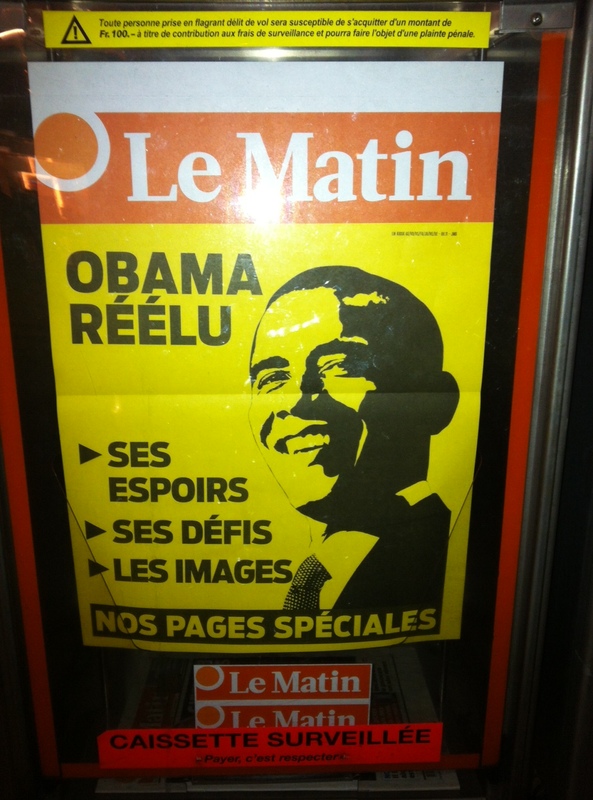 Text reads: Obama re-elected. Their hopes. Their challenges. The photos. This entry was posted in Life in Geneva, Switzerland. Bookmark the permalink. ← Over the river and through the Alps, to Italy we go….